On this day when we remember exactly where we were 13 years ago--and when I gladly wish my father a happy birthday--I'd like to take you back to where I was the first time I heard Boyz II Men's "End of the Road." It was the last day of school at GFS, my last day forever as I would attend a different high school. Bittersweet hugs and phone numbers were exchanged, along with promises to come back and visit a lot. There was also a farewell kiss at the front gate with a beautiful, sweet boy I didn't realize I'd miss so much. Because Karlynne and I were "Karlynne and I," we commemorated the day with coordinated outfits: decorated denim cutoffs and white button-down blouses. We took our Wonder Twin power to her Germantown apartment where we reminisced about favorite GFS moments and feasted on Chinese food with Power 99 FM playing in the background. After stuffing ourselves, we decided to play cards. Pitty-pat was too childish, and poker wasn't our twist, so we decided on 500. We were in the middle of the third hand when the DJ said, "Here's the brand new single by Philly's own Boyz II Men. It's called 'End of the Road'--check it out now on Power 99 FM." As soon as the music started, Karlynne and I looked at each other, caught the beat, and started bopping up and down as we swayed back in forth in our chairs. Laughing at how effortlessly in sync we were, Karlynne played her next card as Nate Morris began singing about this hurtful girl he loved. "Yeah." I frowned at my hand. "I think it'll do well." "End of the Road" eventually spent 13 weeks atop the Billboard charts--beating Elvis Presley's 36-year-old record of 11 weeks for "Hound Dog"/"Don't Be Cruel"--and catapulted the group into a whole new realm of stardom. It is impossible to hear that song without thinking of this moment, and after the week we've had in the news, I think a little light nostalgia is just the ticket. 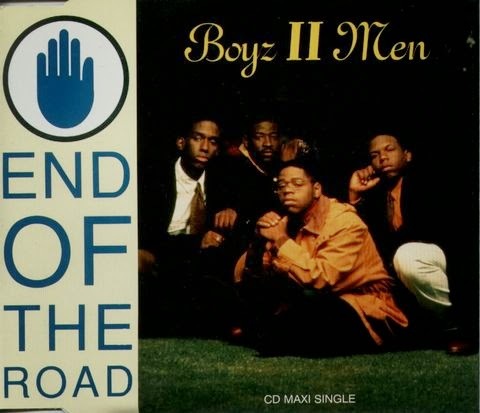 So here's Boyz II Men with "End of the Road." Tell me about the first time you heard a certain song. I hope it's a happy memory. And to those who selflessly sacrificed or endured unspeakable loss on that sad September day, we remember you. And we thank you.